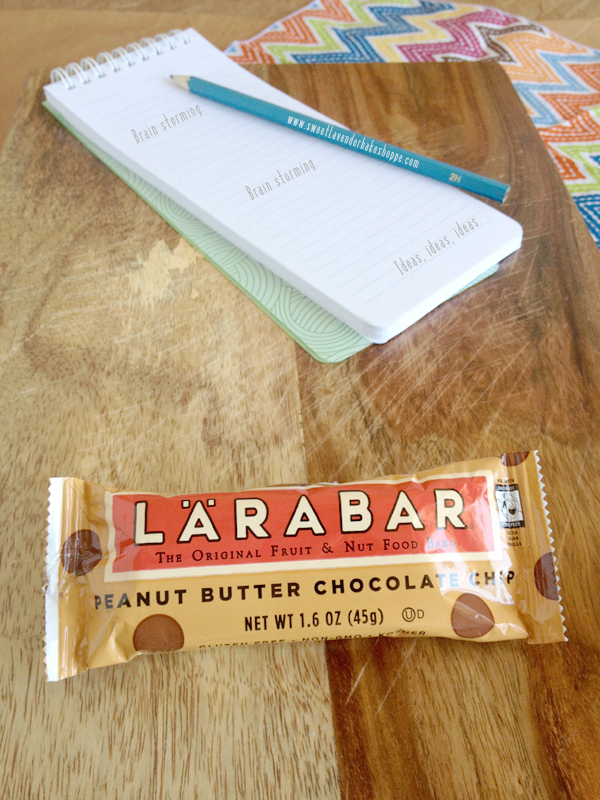 I don't know if your husband is anything like my husband, but if he could, he would bankrupt us with his love of the Peanut Butter Chocolate Chip Larabars. The last time we bought these delicious things (and I mean delicious...if you have not tried one of the wonderful flavors, please do so STAT. Coconut Cream Pie, Cherry Pie, Apple Pie, and these PB and Choc Chip ones are AMAZ-Z-Z-Z-ZING!) I sat reading the ingredient list. There were literally like 4 or 5 ingredients...all things I could actually pronounce and HAD in my kitchen! I was floored! Floored I tell you! Here's the only con I can see about Larabars- for what you're buying and the amount of product, they are a tad on the pricy side. I mean I get it- they are totally natural, made of high quality ingredients, made from REAL things that actually exist, aren't processed, no GMOs...I get it Lara, I get it. But when one's husband literally could eat a bar (or 5) every single day, there needs to be a bit of a price reduction solution. So this idea was born- I will recreate my own version of these delectable bars. Make in bulk, save some money, store in fridge, and have on hand for whenever his hunger pain strikes. Plus honestly, the challenge of recreating something so popular and so loved- and actually having it be as good as the original...I'm like ALL over that. 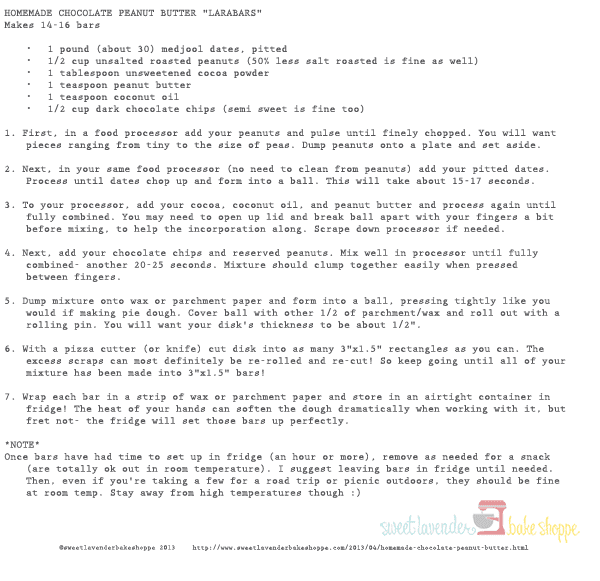 HOMEMADE CHOCOLATE PEANUT BUTTER "LARABARS"
1. 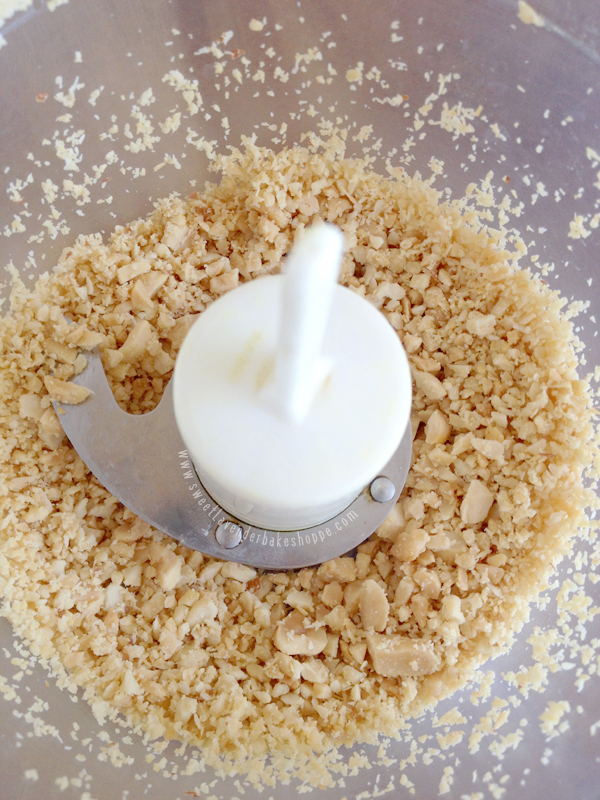 First, in a food processor add your peanuts and pulse until finely chopped. You will want pieces ranging from tiny to the size of peas. Dump peanuts onto a plate and set aside. 2. 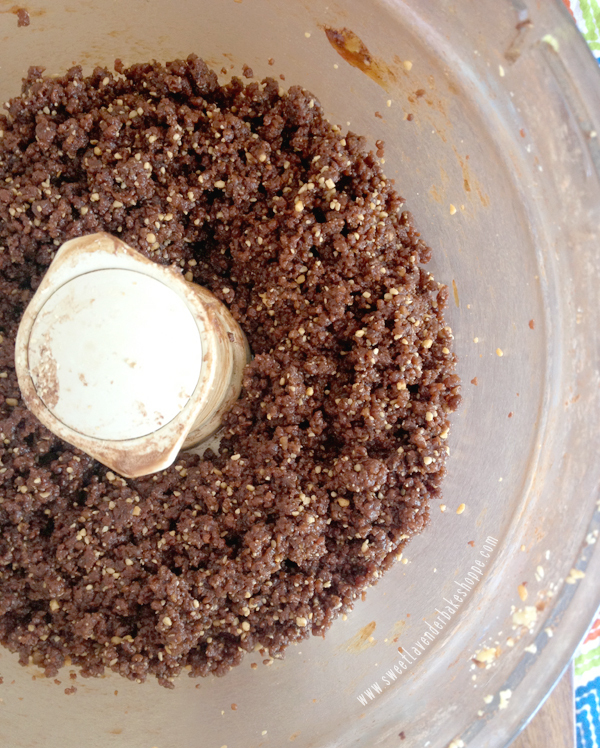 Next, in your same food processor (no need to clean from peanuts) add your pitted dates. Process until dates chop up and form into a ball. This will take about 15-17 seconds. 3. 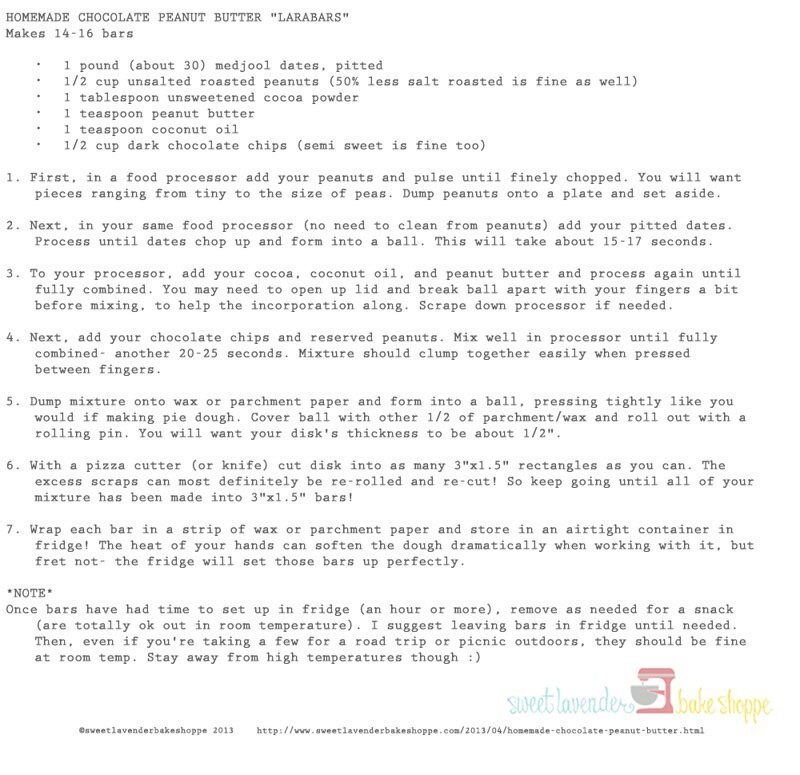 To your processor, add your cocoa, coconut oil, and peanut butter and process again until fully combined. You may need to open up lid and break ball apart with your fingers a bit before mixing, to help the incorporation along. Scrape down processor if needed. 4. Next, add your chocolate chips and reserved peanuts. Mix well in processor until fully combined- another 20-25 seconds. Mixture should clump together easily when pressed between fingers. 5. Dump mixture onto wax or parchment paper and form into a ball, pressing tightly like you would if making pie dough. 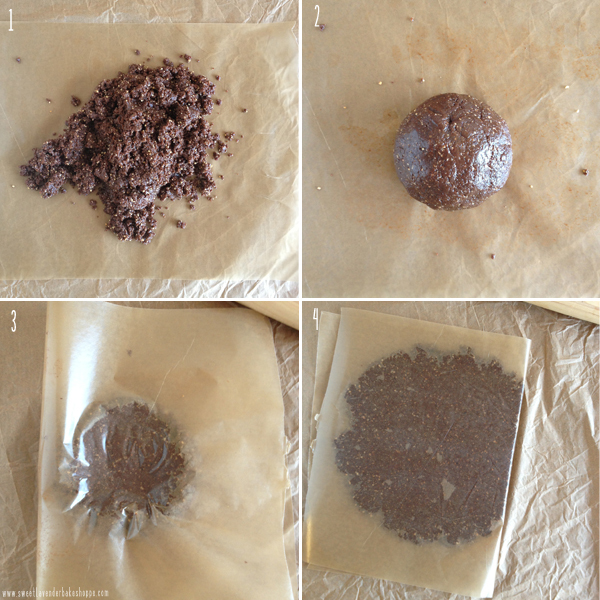 Cover ball with other 1/2 of parchment/wax and roll out with a rolling pin. You will want your disk's thickness to be about 1/2". 6. With a pizza cutter (or knife) cut disk into as many 3"x1.5" rectangles as you can. The excess scraps can most definitely be re-rolled and re-cut! 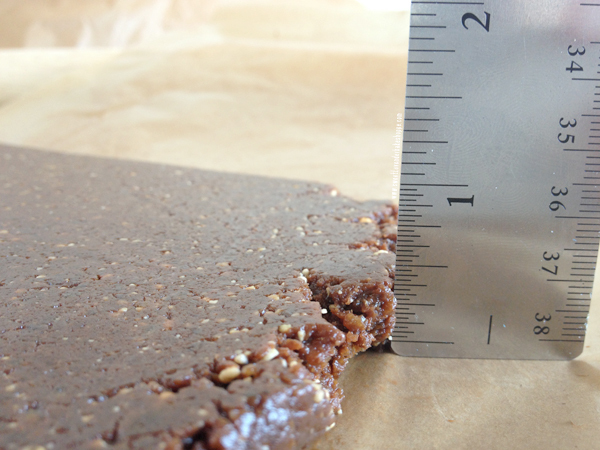 So keep going until all of your mixture has been made into 3"x1.5" bars! 7. 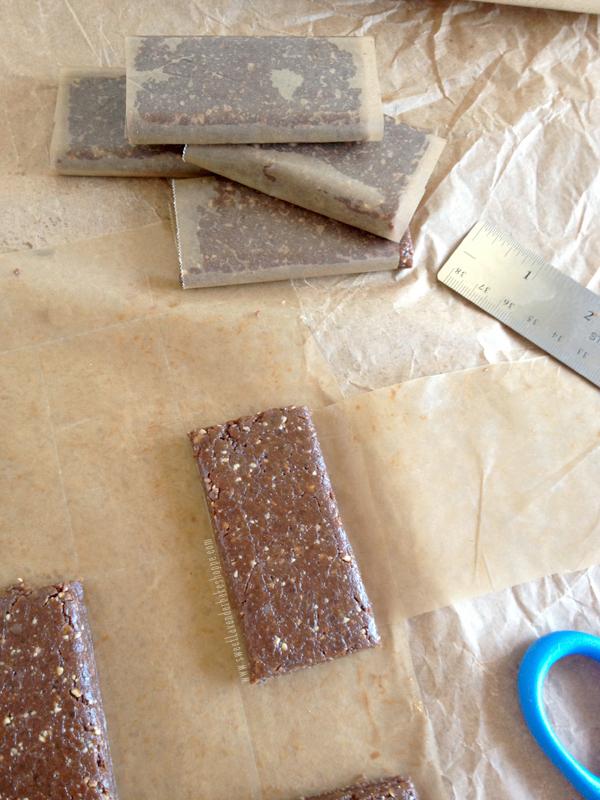 Wrap each bar in a strip of wax or parchment paper and store in an airtight container in fridge! The heat of your hands can soften the dough dramatically when working with it, but fret not- the fridge will set those bars up perfectly. The census- PERFECT! I kid not. 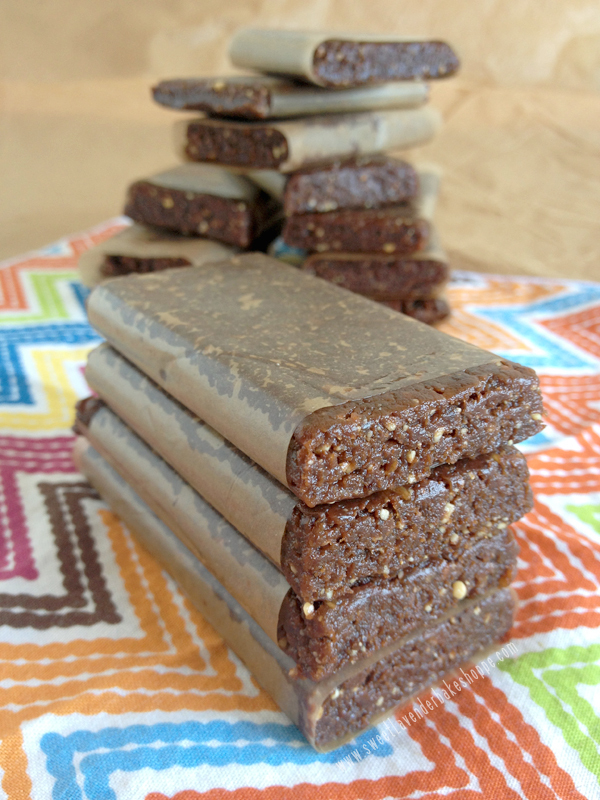 I whole heartedly and with complete honesty can say these new homemade bars ROCK! I blind-tested my husband's palate with an actual Larabar and my version- BOOM he picked mine. Maybe it was because they were made with wifey-love. I hope you guys will try these! Not only because anything homemade is ALWAYS better than store bought (in more ways than one), but because I truly want you to see how easy it is to make your family a healthy unprocessed yummy treat, from scratch, with love. Yippy!! Can't wait to make these. You are a genius! So I eat this larabar probably 90% of my mornings. (never quite made it to early riser status, oops) so I am PUMPED about this recipe!!!! Haha! That's awesome! Hope you enjoy it! omg these look so delicious! I am definitely going to try and make this tomorrow night so I can eat them throughout the week! ohmysweetgoodness! 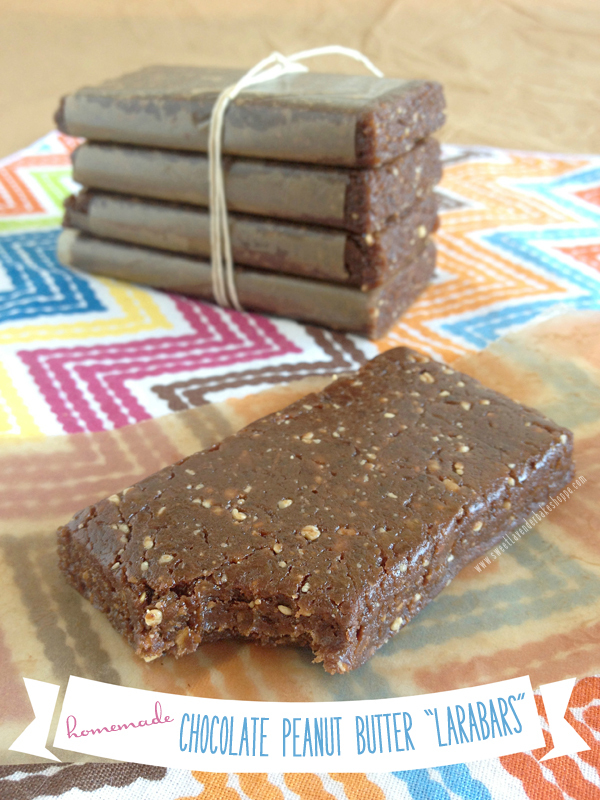 i live for everything that these bars stand for :) clean, wholesome ingredients are the way to go! will be making these asap :) thanks for sharing! I'm wanting to make these asap! Is the coconut oil really necessary? Thanks! Hi there! 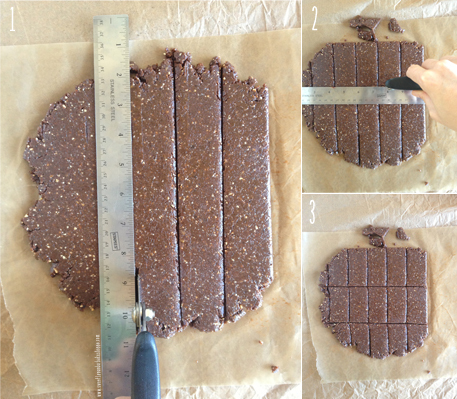 The coconut oil helps the bars get the right consistency. You can, of course try to make these without, but keep in mind you won't be getting 100% what I show here :) Taste wise, they should be pretty much the same, but texture-wise it may be a tad off. If you're ok with that, go for it!